Finally it was Wednesday, the first day of show! First the National anthem was sung and A really nice doggydance perfomance was given before they could start the show. 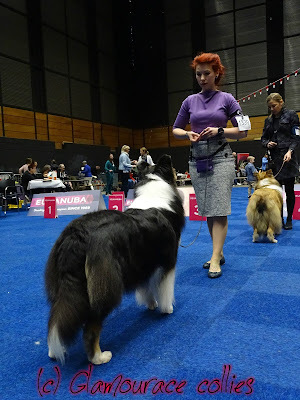 They where starting with smooth collies, and I tought I wasn't really interested in the smooths, but I was encouraged to watch them. When you atented the seminar on Tuesday you could get free mentoring on all four days of the specialty. 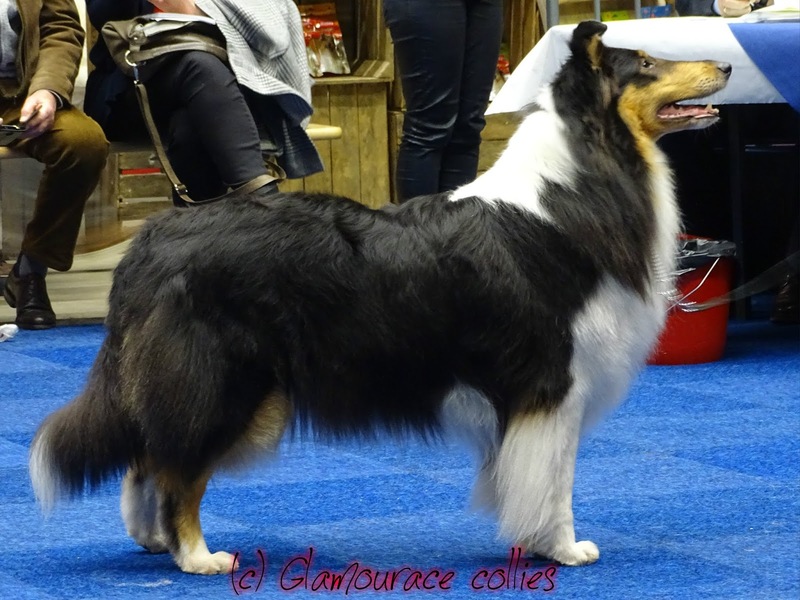 So I was in the mentoring area with a really nice lady/Judge/breeder/friend who told me what to watch for, and how to look at the collie. And it was very usefull, on the smooth there is ofcourse no coat that can hide anything, so it makes it a lot more easy to watch their conformation and stucture. Ofcourse I could not sit down the whole day in the mentoring area, I had to move around and go look for people and browse around. Also during the morning they had a silent auction and the money went to the Collie Health foundation. 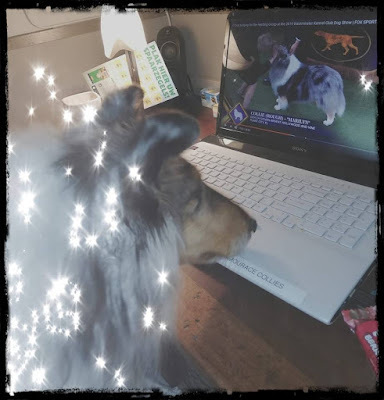 As I am a huge fan of Albert Payson Terhune I could really be happy, many many people who are into collies in the USA are a fan of him!!!! So in the silent auction there where several books of him. I was so happy that I won a few of them!! Also rough youngsters where shown that day!! wow they where really stunning and then this was only the start because the more mature classes had to come yet. 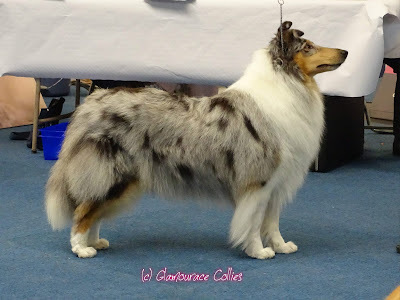 Every now and then I went back to the mentoring area to learn, it was so nice that those people really took the time to really discuss the shape of a collie head, or how a great shoulder should be and on and on. During this day I met so many nice people, I really felt at home on this show. Later I learned that on the evening there was an invitational, and we missed it. That was really sad, because that is a special evening where they present the collies who where in a kind of nomination, and they where presented extra, while their owners where all dressed in very nice gowns. I must not forget to go to this invitational when I go again. 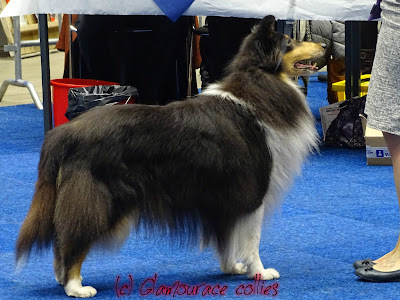 On Thursday there where more rough collies being shown, so I was even more exited then I was the day before. We enjoyed our day. 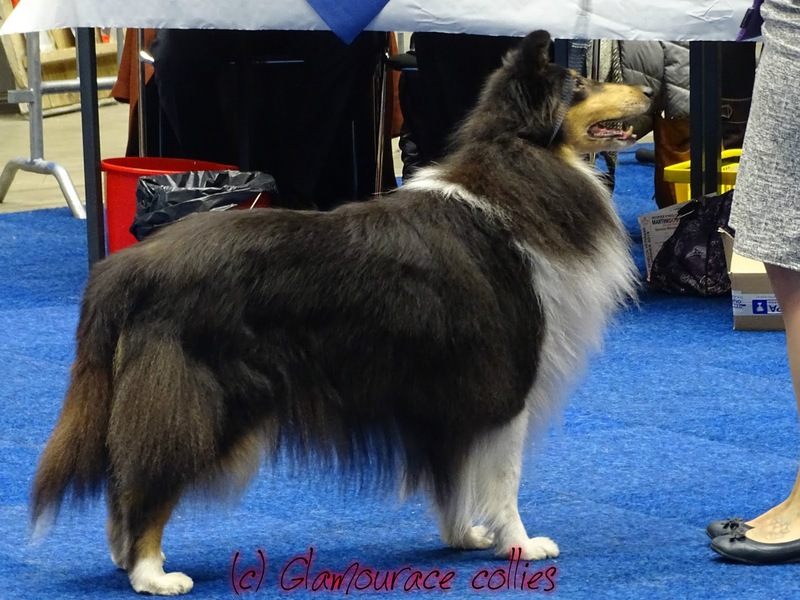 Such beautifull collies, and all groomed to perfection. It was also very nice and funny we had a little morning chat with a man we only knew for a few days and now felt as if he was a friend for a long while! On all 4 days of this show we started of with coffee and a chat with him. Ofcourse this day was also an auction, and I couldn't behave myself so I won a few books again, yay!!! And at the end of the day there was a big Auction held by the collie health foundation, with a nice buffet with it. My dad and I ended up on a table with my English friend, the sweet Judge from the USA (the one who judged my dogs in Denmark) another sweet lady from America, and 2 great people from Sweden!! We had the most wonderfull time, most of the time I was listening to their successtories, but I also could share my tales. 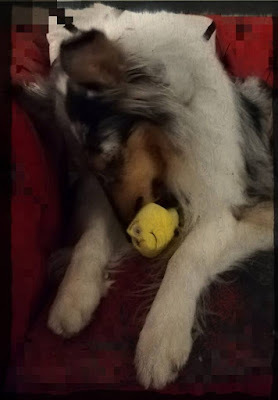 On that evening I learned a lot and it gave me new insights in how a collie is suposed to look and on more subjects. The food was great, we didn't have normal food for days, and we loved it!!! Meanwhile the great trained collie Prosper was getting money from people, if you said "Prosper Money" whe would come over, grab your dollar and then put the money in a basket that his owner was carying!! There where some wonderfull items on the auction, but I didn't have so much money that I could bid myself. 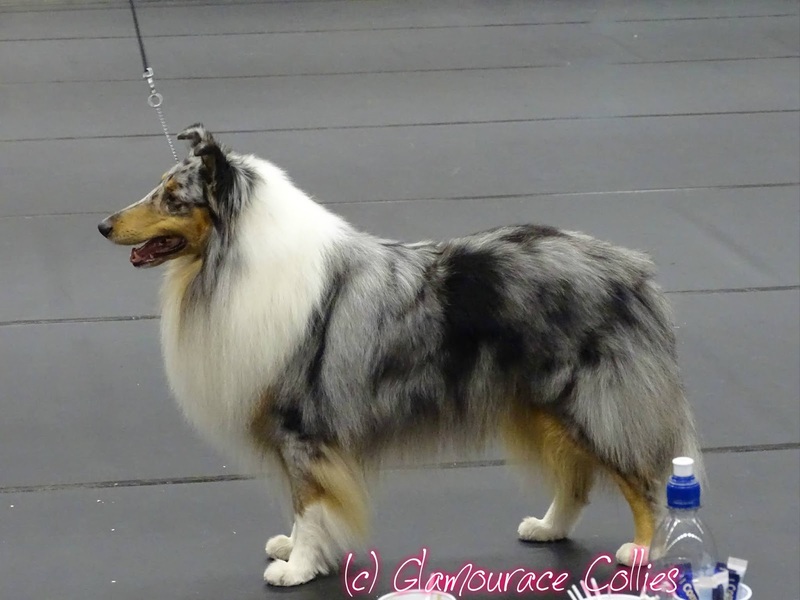 But it was very nice to see that people bid so high and the Collie Health foundation got such a big sum of money, that can be spend on resources for diseases in collies. After a long day of collies and chatting, we went back to the hotel. I was advised to really go watch the smooths again on Friday, this where the best of the best and I could learn. I had such an amazing time on the show and the auction, I saw really beautifull collies and I made great new friendships. I couldn't wait for the next day to come. And that was her last point to become a Belgian Champion. 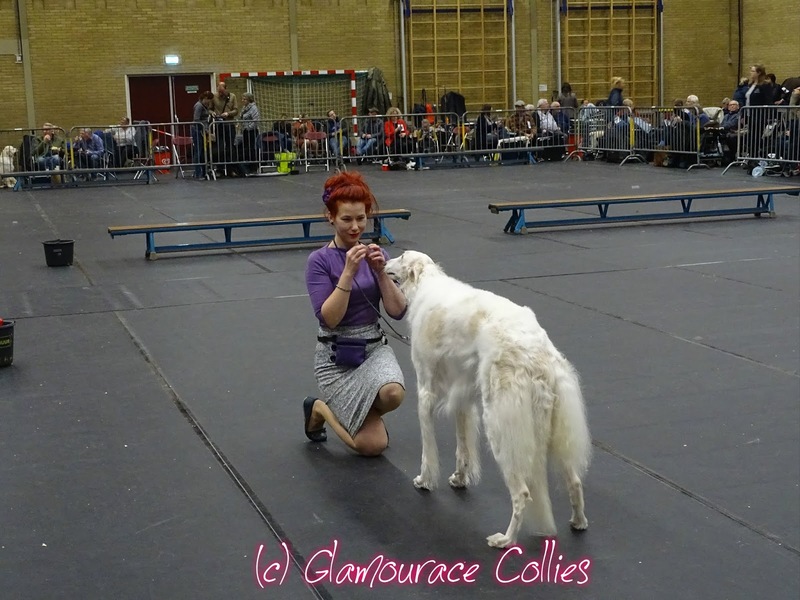 But today on Sunday she managed a great excellent 1 CAC/CACIB and BOS Brabo Winner, by Judge mr M De Geeter. I'm extremely proud that Star managed to get such high rewards 2 days in a row. In 2015 I went to the National Specialty of the Collie club of America, and I never posted a blog on that. 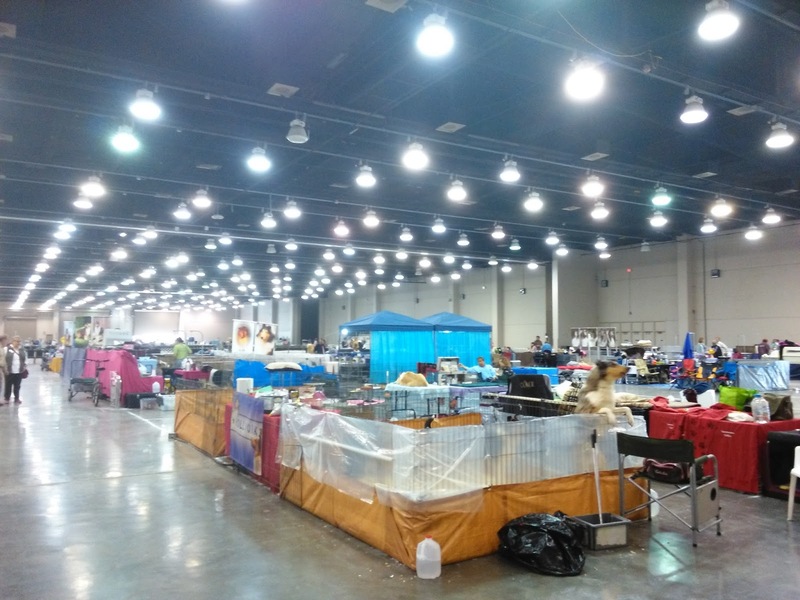 So here is a throwback Thursday to the National Specialty show in Oklahoma city. Since I had such a great time over there, I wanted to share it anyway, eventough it is a few years ago. I will post it in several stages because otherwise this will be maybe a way to long story in one time. My adventures always seem to have a very interesting start, this one also. I think it was the Winner show in Amsterdam in 2013 and I had in my mind already won this show, I know it doesn't work like that, but I googled the Judge and he seemed I was ok with my youngsters. 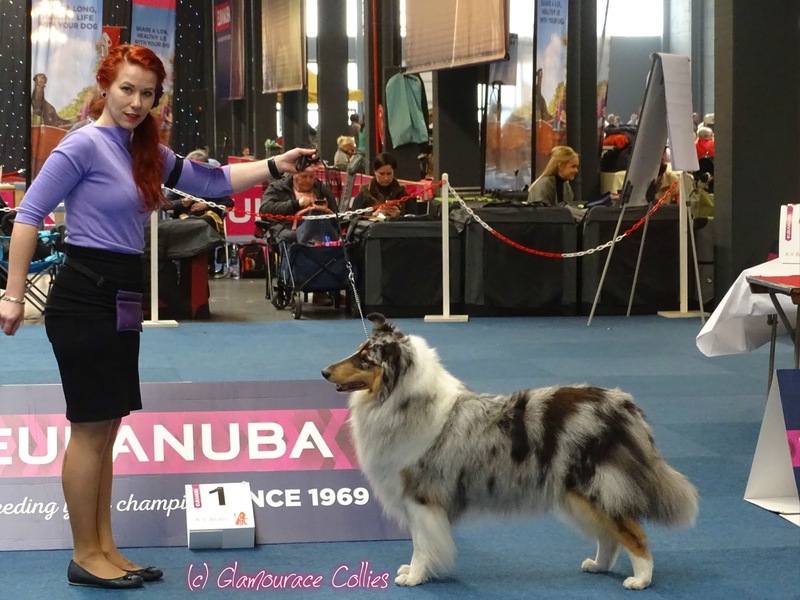 I terribly wanted to win this with my girls because at Crufts 2014 was a Judge I was really curious about so there was no other plan then get that qualification. Well that mission failed. All of my girls were awarded very good, and that was exit Crufts 2014, ok I went there but without one of the girls. 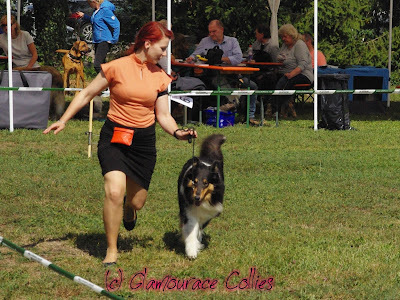 At home I was so mad and dissapointed and everything I was saying, well if they don't like my dogs over here, I'm gona go to the United States and go watch real beautifull collies. You can imagine my parents tought I was getting crazy, but when I talked about it for the whole week, my dad came to the conclusion if you go, then why not take Vivien with you. And that is how my adventure started. It was too short a time to get a plane with a dog before the Nationals of 2014, so we set our goals to 2015 in Oklahoma city!! There was a lot to get aranged, and the hardest part was getting a place for Vivien, not all flyingcompanies take dogs. So after a lot of calling and mailing everything was settled and we could go. And then came februari 2015 almost 2 weeks prior to show, and Vivien decided to drop her coat, totally, and I mean totally, she was looking like a smooth collie. I was so sad, because I really wanted to show her. So 1,5 week before departure we called our traveling agent to cancel Viviens flight, we where going, but now whithout her. Finally it became march and I was looking on my Facebook as I sat at the airport, and most of my friends where heading to Birmingham to watch the Crufts dogshow, and I was waiting for my plane to the USA!! I was so exited, I never flew before so that was a new experience for me. And I loved it. 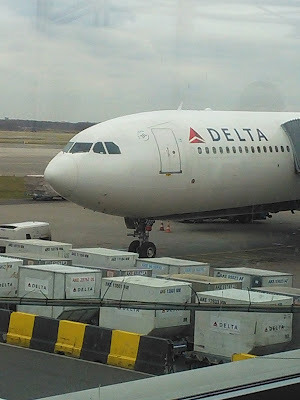 Our trip was super, no humps and bumps along the way, only a little delay in Atlanta where we had to take another plane. 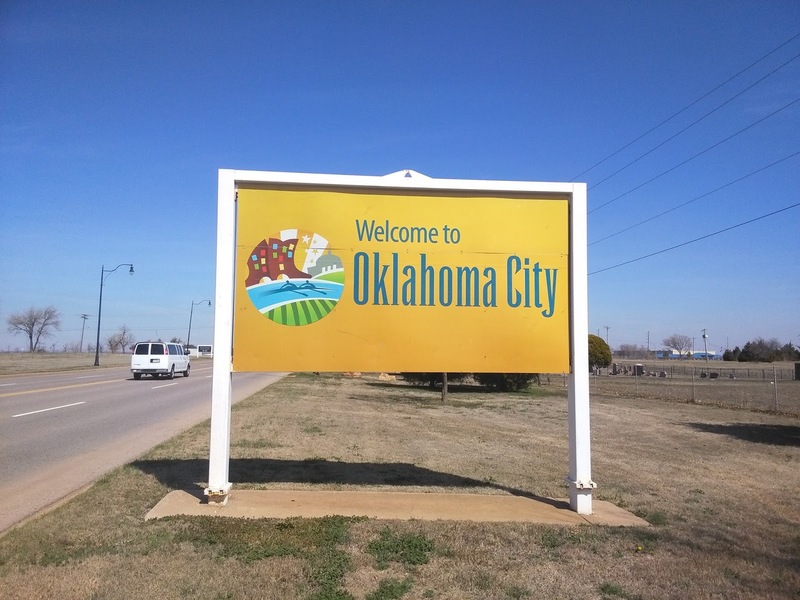 And finally after an exhausting trip of almost 12 hours we arived in our hotel in Oklahoma city. 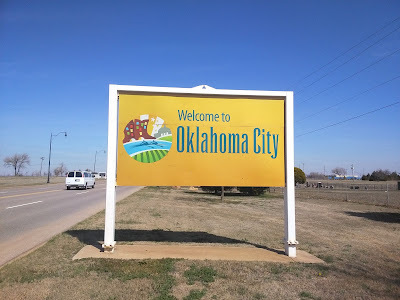 The first few days where just for sightseeing, we had some extra time before the show because of Vivien, but now we didn't really need that extra time, so we went to go see the Botanical gardens, Bricktown and the Will Rogers park, that where some of the attractions that where a mustsee in OKC. The lecture was a long one, we started early in the morning, I think about 8 o'clock am. and it lasted until after lunch. I'm always a bit of a picture thinker, so after 2 hours of lecture I started to get nauseus, afterwards I could laugh about it, but it was actually not so funny. They had nice videomaterial of c section and that was to much for me. So lucky me they made a dvd of it, so I rewatched several times now at home. After this nice lecture we where planning to go back to the hotel, but we found out we could go into the exebition hall where everyone was setting up their stuff!! Wow, it was beautifull, people really made their x-pen's and stuff stand out, so you could recognize them easily! And what i'm not used to at home that people where bathing their dogs on the showsite, amazing. And then again I met some really friendly people, and many I knew only by their Facebook profile and now they where becoming real people. Many of them where so happy I finally took the time to go to the Nationals so I could see for myself if I liked it or not. After going though the hall a few time, taking to people and watching the collies that where already there, we where really exhausted, we where there since 7:30 am for the lecture and we went to the hotel I think round 4 pm. We where already so overwhelmed and then the real show wasn't even begun. We where very busy campaigning Emmy for the competition "mooiste hond van Nederland" so I didn't do an update on the website. But in the first weekend of march we went to the Benelux Winner show in Groningen and we did super. 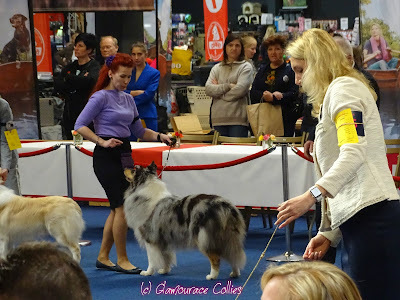 I entered Vivien after a long absence from the showring and she did very well by getting excellent 2 in openclass. 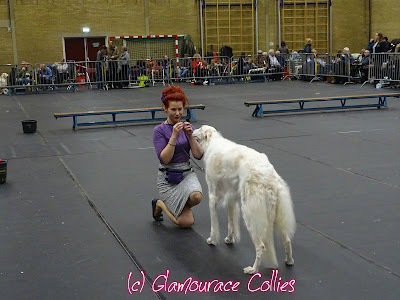 Dita was again in Veteranclass and she nailed it, excellent 1 and again a veteran Best of Breed. And the titel Benelux Veteran Winner to go next to her name!!!! Thanks Judge mr Jan Ebels to make this possible, i'm proud of my kids. And I must not forget Emmy, she got the second place in the competition in my region. So the campaingning was not all for nothing. Last Tuesday there was a score and Emmy was on second place in our area, but we want the first place ofcourse. Emmy has as you could read in the last post her own webpage, and it seems people really like to read those fun and informational posts, so I might even try to translate those posts later on if the contest is closed. And here are a few fun pictures of some things we did the last few weeks with Emmy as the leading dog!!! 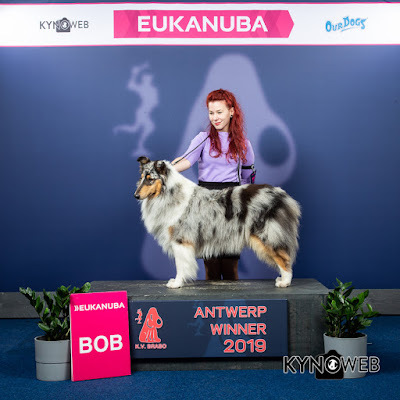 So we are in a contest, my dad decided to enter Emmy in a picture contest called, "de mooiste hond van Nederland"
At first we tought it was only a Facebook like and win contest, but it is way more then that. I have to convince people in the Netherlands they need to vote for Emmy. That means I have to "campain" her. I saw that many people are doing that by telling the local newspaper that they have a beautifull dog, but I don't like to do that. Emmy is a carefully bred purebred dog. Her breeders took much care in selecting for not only pretty animals, but also caring for health and temperament. Because I think a purebred dog from respectable breeders should Always include health and temperament aswell as beauty. 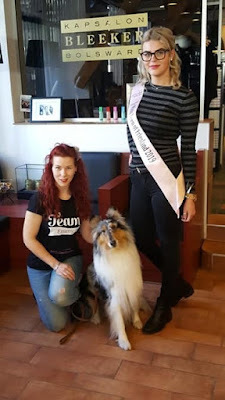 It is a bit sad that only people from the Netherlands can vote, but I hope we will get many votes and make Emmy the most beautifull dog in the Netherlands, and make sure that purebred dogs are getting a little more positivity. Yesterday we went to the funmatch in Rijssen, I never went there and I was just curious, so we went there. Mr Gerard Jipping was judging the collies and the borzois. And I'm very happy that Lucky got Best of Breed and Anna also got Best of Breed. Anna also got reserve Best in group. Altough this was my least favourite showsite ever, I'm very content with the results we got. 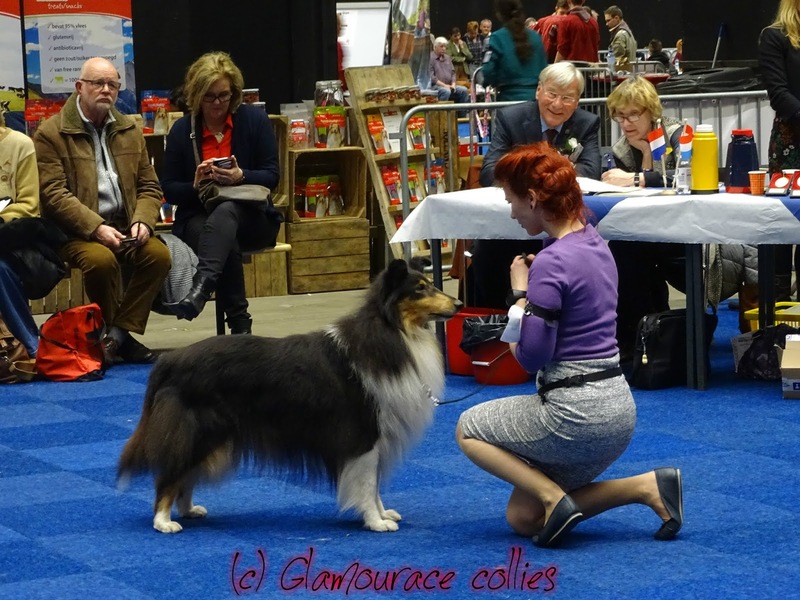 All stories and pictures by Antje Alberda/ Glamourace Collies. Thema Luchtig. Mogelijk gemaakt door Blogger.